Welcome to the second post for Warhammer 40k D&D 5E Hack, my (what was originally meant to be rather quick) exploration into how we can bring the darkness of the far future into the d20 world. A party in Warhammer 40k D&D 5e has a Resources score to simulate how the wheelings and dealings of the universe turn out for them when the time comes to equip themselves for a mission. The party’s Resources ability score is equal to their average party level + Charisma modifiers. After accepting an operation, the GM makes a Wealth check on behalf of the party (1d20 + Resources ability modifier). The PCs receive temporary equipment and gear of a value equal to 200 gold x the result of the Resources check (minimum 300 gold). Any item purchased by the operators with the gold acquired from a Resources check must be used during the operation or directly before its undertaking. After an operation is over temporary equipment and gear that remains mysteriously disappears, gets broken, fell out of a character’s pack during combat, or otherwise becomes unavailable to the party. Any item that requires attunement cannot be acquired with these funds, but by paying double the normal price a piece of temporary equipment or gear can be bought as a regular item. Items that grant permanent bonuses are ineligible as well, and when calculating item value, use the maximum amount (100bt for common, 500bt for uncommon, etc.). For example, a party of four PCs at 8th level with the following Charisma scores (13, 18, 15, 14) has a Resources ability score of 17 (average party level 8 plus 1 + 4 + 2 + 2). The GM rolls 1d20+3 and gets a 15 for a total of 18, so the party gets 3,600 gold of temporary equipment and gear. The PCs should play a large role in how the temporary equipment and gear is acquired (via favors, contacts, the bureaucracy of the Imperium of Mankind, etc.). Increase the amount of funding received by +50%. It is impossible for any of the items acquired to become regular items. After a mission is over you can spend your own gold to make pieces of temporary equipment or gear into regular items at half the normal price. Armored Bodyglove (Uncommon, 11 lb.). Unlike most armor, a creature may wear an armored bodyglove under clothing or other suits of armor. While wearing an armored bodyglove, the wearer’s AC equal 14 + the wearer’s Dexterity modifier (or better, if they are wearing a superior suit of armor over the armored bodyglove). Detox Pill (Uncommon, 0 lb.). After ingesting this small, foul-tasting black pill, a creature suffering from a poison or disease not borne from the Warp can immediately make a new saving throw to rid themselves of it. The creature has advantage on this saving throw. On a success the disease or poison stops spreading, though its effects may linger for as long as 1 hour. Grapple Gun (Common, 4 lb.). Depending on how it is designed, this device resembles either a crossbow or firearm with a grappling hook fixed onto a spear that emerges from the front of it. As an action, the wielder of a grappling gun fires it at a perch within 500 feet–a crux of tree boughs, the corner of a building, the top of a street light, cluster of rocks across a chasm–and makes a ranged attack roll against an AC of at least 13 (at the GM’s discretion, more difficult targets have a higher AC). On a successful hit the device’s grappling hook affixes itself and until the wielder moves more than 10 feet in any direction, they may spend a bonus action to retract the line and move 100 feet in the direction of the square adjacent to the grappling hook. A grapple gun that has its line obstructed by another creature or broken (AC 15, 10 hit points) becomes inoperable until it is reloaded. Reloading a grapple gun requires 2 actions. When fired as an attack against a creature, on a successful hit the target takes 2d4 bludgeoning damage and makes a DC 7 Strength saving throw or is knocked prone. Injector (Common, 1 lb.). These ampules can be self-administered as a bonus action or jammed into a creature with an Attack action and successful melee attack roll. For 1 minute, the drug from an injector grants its benefits to the target, after which it suffers a penalty equal to the formerly gained bonus and makes a Constitution saving throw (DC 10 + 1 per drug dose taken in the last 24 hours) or suffers 1 level of exhaustion. Example bonuses include: +1 bonus action each turn, +2 AC, +5 hit points per point of proficiency bonus, +15 ft. movement, +3 to any ability score (this can increase a score above 20). Jump Pack (Rare, 50/100 lb.). By spending a free action on its turn, the wearer can activate the jump pack and increase the distance of any jumps they make by 40 feet horizontally and 60 feet vertically until the start of their next turn. This increase to jumping distance only increases the wearer’s speed for the turn and only if the wearer moves by jumping. Jump packs automatically deactivate at start of the wearer’s next turn. Leaving a jump pack active for consecutive turns eats twice as much of the devices power but grants a fly speed of 40 feet. A creature can use a jump pack for to leap up to 10 rounds (or fly for 4 rounds), regaining 1 round of use for every 1 minute they are not in use. Krak Grenade (Uncommon, 1 lb.). This small, cylindrical explosive can be thrown at a target within 60 feet as an action (or further with the use of a weapon with the launcher quality). Any creature within the grenade’s area of effect (20 feet) makes a DC 15 Dexterity saving throw or takes 8d6 fire and force damage (a successful save halves this damage). Lho-Stick (Common, 0 lb.). After lighting and smoking one of these stimulant-filled combustible sticks (a bonus action and minimum of 2 minutes) a creature finds itself more awake and restored, regaining a single use of one feature that has multiple uses which recharge on a long rest. This does not include spellcasting. A creautre can only benefit from a lho-stick once per 6 hours. Mechadendrites (Rare, 10-50 lb. depending on the limb). Virtually all servants of the Mechanicum (and Dark Mechanicum) possess these cybernetic implants located somewhere on their body, generally on the back of the neck but always accessible to main conduits of the central nervous system. Using mechadendrites grants a +2 bonus to Technology checks and any check where the creature is using their mechadendrites (this does not include attack or damage rolls unless the wielder also has power armor). In addition, the wearer’s unarmed strike damage increases by +2. Runic Protections (+1 for 1,000 gold, +2 for 2,500 gold, +3 for 5,000 gold). Having these holy and sanctified runes emblazoned on armor or weapons helps protect from the malign influences of the Warp. These must be maintained and restored by priests capable of blessing them after every mission. A creature wearing or wielding an item with runic protections gains a +3 on saving throws to resist a spell that can cause Corruption and on saving throws to resist increasing Corruption. Subdermal Mic (Common, 0 lb.). A subdermal mic is a miniaturized two-way short bandwith radio transceiver that broadcasts to a range of 10 miles. Anyone within range and tuned to the broadcast frequency (which can be calibrated using the Science or Technology skill) is able to hear messages sent from the subdermal mic. The subdermal mic is also able to receive messages provided it is tuned to the frequency they are broadcast at. Radio waves travel through solid objects. Subdermal mics run off of the wearer’s body heat and can be spoken into and heard without anyone but the wearer hearing the transcieved messages. Void Shield (Rare, 5 lb.). When active (a bonus action) this device emits a forcefield around the wearer. Whenever the wearer would take damage, the forcefield is damaged first. The forcefield has 30 hit points and regenerates 1 hit point each round. When a forcefield is reduced to 0 hit points, the void shield breaks and requires a DC 20 Intelligence (Technology) check and 1 minute of work to repair. Deactivating a void shield is a reaction. Vox (Common, 10 lb.). This device can be as small as a belt pouch for elite models or as big as a backpack for large, bulky military models. A vox operates as a subdermal mic does, but is capable of picking up frequencies on multiple different spectrums and can operate to distances of up to 1,000 miles (at the GM’s discretion). Any ranged weapon below that does not have the loading property is assumed to have the autofire property. Autofire. A character wielding an autofire weapon may spend a bonus action to gain an additional attack at disadvantage. If the wielder is able to make an additional attack as a bonus action for some other reason, they may make both attacks but with disadvantage. Bullet Spray. Bullet spraying weapons can expend five times as much ammunition as normal to spray a 5-foot-cube area within its first range increment as an action. Creatures in the area of effect that fail a Dexterity saving throw (DC equal to the wielder’s attack roll) take the weapon’s normal damage. By expending 10 times as much ammunition as normal, the wielder can increase the area to a 10-foot-cube. Range: Area. When a creature uses a weapon to fire a cone, line, or sphere (instead of at a specific target) the wielder makes a separate attack roll for each target in the area (objects included). HUGE THANKS to my Head of Minion Sciences (Dixie Carr) for categorizing and adding weights to these! the wearer’s AC becomes 14 + Dexterity modifier (maximum 2). the wearer gains darkvision 120 feet. the wearer’s Strength score increases by 2 (this does not modify its maximum Strength score). the wearer is able to jump as far as 30 feet horizontally or 20 feet vertically without the need for a check (these distances are added to the distances that result from any jump checks). the wearer reduces all falling damage by 30.
the wearer’s unarmed strike damage changes to 1d6. melee weapons mounted onto the power armor cannot be disarmed. as long as the power armor has a helmet, while the suit is intact it grants immunity to all gas-based attacks and effects, possessing an internal air tank the wearer can breathe from for up to 4 hours. the wearer is able to walk on metal surfaces in the void of space or zero gravity environments. NOTE: It is mentioned in the flagship post for this series, but it bears mentioning again–if you give one PC power armor, give everybody power armor. Mark V Carapace (Rare, 400 lb.). Increases Strength by 4 (instead of 2) up to a maximum of 24, increase Constitution by 2 up to a maximum of 22, damage resistances (cold, fire), and the wearer ignores the first 5 points of damage whenever it takes non-psychic damage. Mark VII Carapace (Legendary, 500 lb.). Increases Strength by 5 (instead of 2) up to a maximum of 24, increase Constitution by 4 up to a maximum of 24, damage resistances (acid, cold, fire), and the wearer ignores the first 6 points of damage whenever it takes non-psychic damage. Living Carapace (Near Unique, 900 lb.). Increases Strength by 6 (instead of 2) up to a maximum of 26, increase Constitution by 6 up to a maximum of 26, damage resistances (acid, cold, fire, force), and the wearer ignores the first 7 points of damage whenever it takes non-psychic damage. You are always able to act in the surprise round. *Chaos Space Marines that are Veterans of the Long War might get their hands on Terminator Armor instead of Living Carapace. Mark VI (Rare, 400 lb.). Increases Strength by 4 (instead of 2) up to a maximum of 24, increase Dexterity by 2 up to a maximum of 22, damage resistances (cold, fire), and the wearer ignores the first 5 points of damage whenever it takes non-psychic damage. Mark VII (Legendary, 500 lb.). Increases Strength by 5 (instead of 2) up to a maximum of 24, increase Dexterity by 4 up to a maximum of 24, damage resistances (cold, fire, lightning), and the wearer ignores the first 6 points of damage whenever it takes non-psychic damage. Ignatus Power Armor (Uncommon, 100 lb.). Does not increase the wearer’s Strength score. Additionally it normally does not come fully sealed or helmeted (an additional 500 gold), but it does count as light armor for purposes of proficiency. Sororitas Power Armor (Rare, 200 lb.). Resistance to acid, cold, fire, and the wearer ignores the first 3 points of damage whenever it takes non-psychic damage. Eldar Power Armor (Legendary, 100 lb.). Increases Dexterity by 6 (to a maximum of 26) and speed by 30 feet. Ork Power Armor (Rare, 750 lb.). Increases Strength by 6 (instead of 2) up to a maximum of 26, and the wearer ignores the first 2 points of damage whenever it takes damage. Squat Power Armor (Rare, 200 lb.). Increases Constitution by 4 (to a maximum of 24), increases Strength by 4 (instead of 2; maximum of 22), and the wearer ignores the first 8 points of damage whenever it takes non-psychic damage. Tau Power Armor (Rare, 200 lb.). Resistance to cold, fire, radiant, and the wearer ignores the first 6 points of damage whenever it takes damage. That’s it for today’s post! Tune in next week for the beginning of Class Archetypes! hey there! 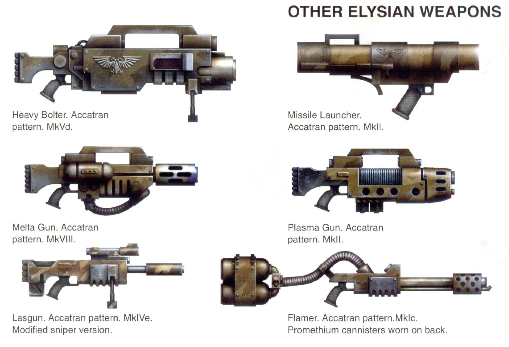 what about plasma weapons? Choose a weapon in the appropriate category, model it off the nearest thing, and have it deal half fire/half lightning (or swap one for half radiant; just be consistent whichever you do). I’d also probably increase the price (33%? 50%? ).